Yes, I am so pathetically proud of my little seedlings that I took pictures of them with my phone (hence the risible quality). I would have used our camera had it not been stolen by a nasty baggage handler some months ago. Mental note: must buy another one. And out in the garden, a row of infant rocket. Aren’t they cute? I feel bad for planning to eat them eventually. It’s great isn’t it. I’m a beginner in such matters as well, but I started last year. The only survivors from an attempted crop of four types of veg were the courgettes and pumpkins. The broccoli were devastated by caterpillars, and the onions just rotted in the ground. There’s nothing quite like eating stuff that you’ve grown yourself (notable exceptions being warts and offspring). Cameras: just bought a Sony Cybershot DSC 50. I’ll review it through Conor’s LouderVoice one of these fine days, but in the meantime I can really recommend it. They look great, very satisfying eating your own produce. I’m pretty amateur in the garden too but I managed to grow lettuce and rocket last summer. I put my thyme in a big pot with my flat leaf parsley and it out competed the thyme a bit, so didn’t have much to speak of. My favourite thing is my bay tree, I use that a lot, although I can’t pretend I planted it. I’m going to try and plant peas this year if I ever motivate myself to get my posterior in the garden. Love the look of those! I’ve had rocket growing in the garden for a couple of years and let some of it go to seed…so it & nasturtiums are dotted allover the place now! It gives a very higgledy-piggeldy air to the garden, but I love coming across a new crop in unexpected places! Ahem, that last post was from me … logged in as our residents association! Sorry! No problem, Jenny, I guessed it was you! We had nasturtiums in Dublin…and so did all our neighbours after a while. They were not all happy about it! Sarah, I can proudly report that I have since also planted peas. This is despite grumblings from the husband, who may be almost 35 but is still “afraid of peas”. Brendan, “warts and children” made me laugh. Actually, since I posted, we bought an Olympus something or other but haven’t had a chance to try it out yet. Will see how it goes. 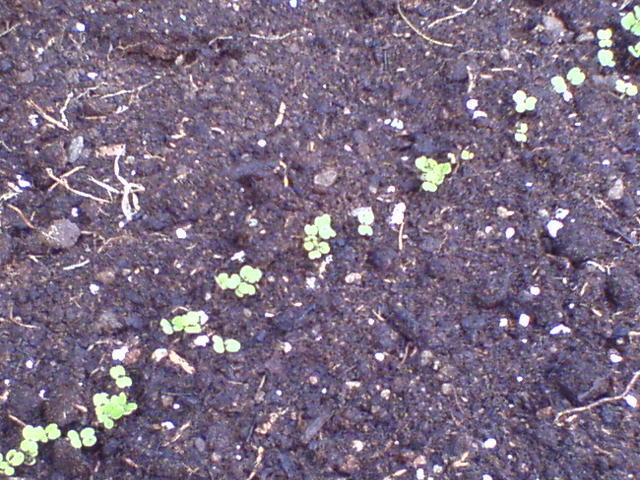 Ooh, and I should also report that, as of today, mint, dill and lettuce have also poked through the soil. It’s really very exciting. Stainless steel pressure cooker have experienced renewed popularity over the last several years because cooks have rediscovered what some cooks (particularly grandmas) have known for a long time–they’re really fast. am really enjoying the theme/design of your blog. Do you ever run into any web browser compatibility problems? A handful of my blog readers have complained about my website not operating correctly in Explorer but looks great in Firefox. Do you have any recommendations to help fix this issue? Should cosmetics smell like food?